Kapuso heartthrob Geoff Eigenmann says he’s excited to work with his dad Michael de Mesa in GMA’s new afternoon drama program Kasalanan Ba Ang Ibigin Ka?, which is scheduled to air its first episode on June 4. This is the first time that Geoff and Michael will be working together in a television series. The last time they were together was in the film First Day High. Asked whether he feels pressured by the fact that he will be working alongside his father who is very well an established actor in the industry, he says that he sees working with a family member an advantage rather than a hindrance. 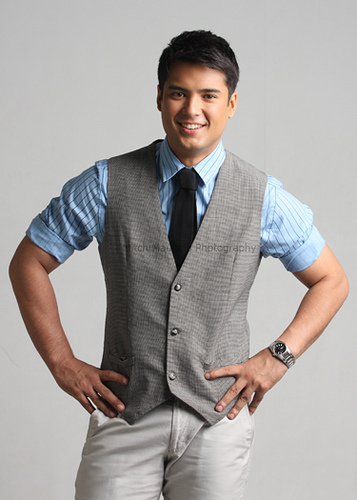 In Kasalanan Ba Ang Ibigin Ka?, Geoff will team up once again with Jackie Rice as his leading lady. Jackie and Geoff recently starred in an episode of GMA’s Spooky Nights. Geoff says that he’s comfortable working with Jackie because they have a good chemistry on and off-screen. In the soap’s story, Geoff’s character will fall in love with Jackie’s. However, the two will eventually split and before long Jackie will fall in love with a much older – and more matured – divorced man (Michael de Mesa). But what is unknown to her is that Michael is the father of her ex. In the end father and son turn into rivals, besting each other to win Jackie’s heart. Apart from his new afternoon soap, Geoff also stars in the primetime series Legacy. Does he get enough time to rest? Despite his hectic taping schedule, Geoff makes sure he has time for girlfriend Carla Abellana. Geoff will start taping for his new soap next week, but he’s not complaining. Geoff also commented to an issue linking his cousin Andi Eigenmann to the fracas wherein the latter’s ex-boyfriend Albie Casiño was apparently beaten up by Andi’s peers in the parking lot of a bar in Makati.